Taiwan has recently garnered international attention for high-profile cultural centres by Toyo Ito & Associates, OMA and Mecanoo, but local architects are also doing good, if less showy, work. A warehouse conversion by the Taipei firm Waterfrom Design, for instance, is a model of frugal creativity. The client was Forest Spring Enterprise, which manufactures water dispensers and related equipment. The challenge was to transform a 30-year-old storage facility into a light-filled office. Blue task chairs pop against the textured, largely grey palette of a meeting area. Various functional zones are spread across two floors. Long work tables, arranged in rectilinear fashion, have been outfitted with red metal light towers. The facility’s glass-enclosed laboratory is pictured in the background. Overall, it was a happy marriage between a client whose business is water purification and a firm that takes its name and inspiration from water. Indeed, the studio’s mission statement likens design itself to water, extolling the “simple and pure, organic and ever-changing. We maintain the belief that aesthetics come from approximating what is natural.” That ideal – of harmony between humankind and nature – underlies the Forest Spring Enterprise project, inspiring Waterfrom to infuse a cavernous steel-framed shed with a sense of fluidity. 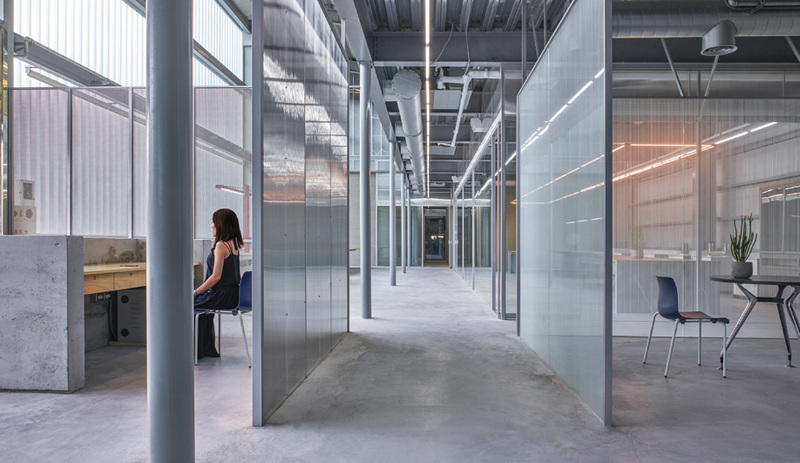 The new channel-glass facade brings natural light into the formerly windowless warehouse. The company’s previous office space, located next door, had been cramped and dysfunctional, isolating each department from the others. 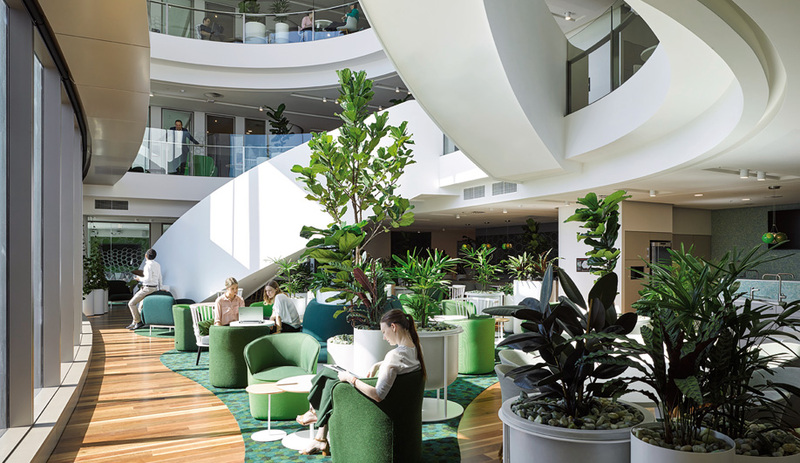 After a survey of the 890-square-metre warehouse, Waterfrom concluded that the building had the height and width to provide generous work and social spaces for up to 60 staff members on two levels; Forest Spring Enterprise consequently decided to convert the facility into offices and to transfer its employees there. Working on a tight budget, Waterfrom retained most of the original structure, preserving its industrial character. A major challenge was ensuring that the building would withstand the typhoons and earthquakes that periodically happen on the island. 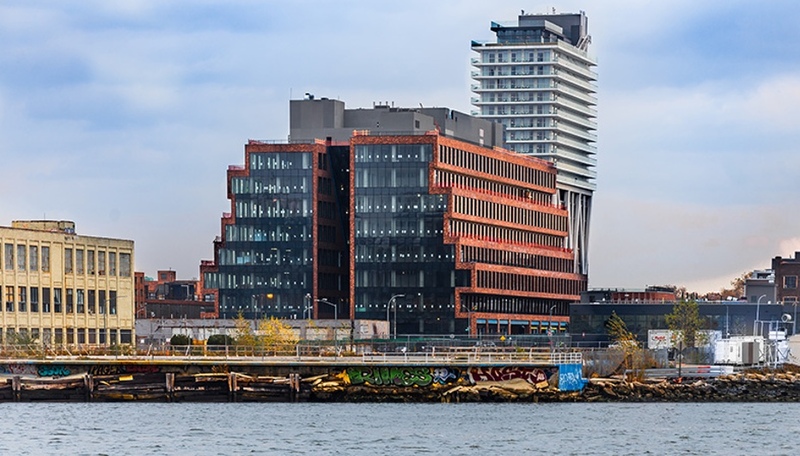 As the warehouse had been windowless, the architects created a new facade of channel glass that diffuses natural light while providing thermal insulation. There is a new entrance portico, and the manufacturing wing – which extends out at a right angle to the rectilinear office – was enlivened with bold colour stripes. The architects also added a guard house (whose projecting roof embraces a tree) and a recycling facility that is made less conspicuous by its transparent plastic curtains. These small additions play off the larger structures. An imposing concrete reception desk welcomes visitors to the redesigned building. 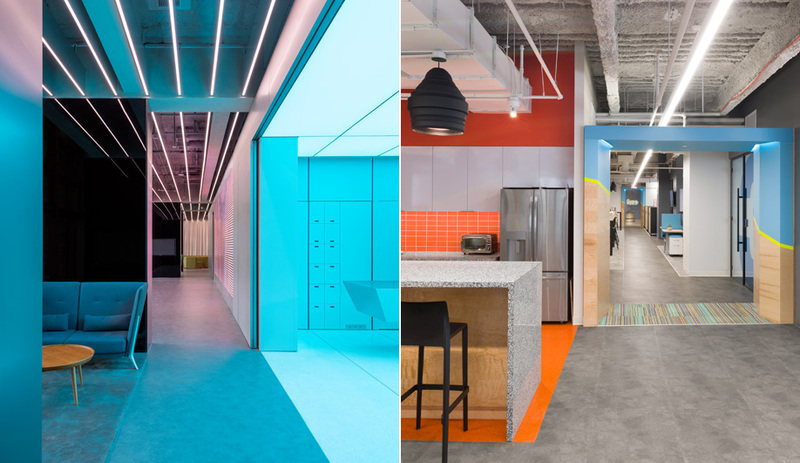 Strategic hits of bright colour enliven the expansive office suite created by Taiwan’s Waterfrom Design in a former storage facility. For the interior, Waterfrom took its cues from the filters that the client produces, layering the open-plan volume with pattern and texture. A rough elegance distinguishes the concrete desk in the reception lobby, while translucent screens define the reception area and meeting rooms. A laboratory is enclosed with glass, putting the scientists on display while protecting their experiments. There is a linear rhythm in the succession of desks, pipes and beams, and colour is used sparingly: yellow for the railings of the mezzanine gallery, red for the metal tower that illuminates a long work surface, red and blue for plastic chairs. These vibrant accents jump out from the soft grey of the concrete floor and the exposed steel of the structural frame and overhead ducts. Yellow metal railings line nearly the entire length of the building’s second floor. Forest Spring Enterprise is located in the provincial city of Chiayi, far removed from the high-speed train links between Taipei and Kaohsiung. 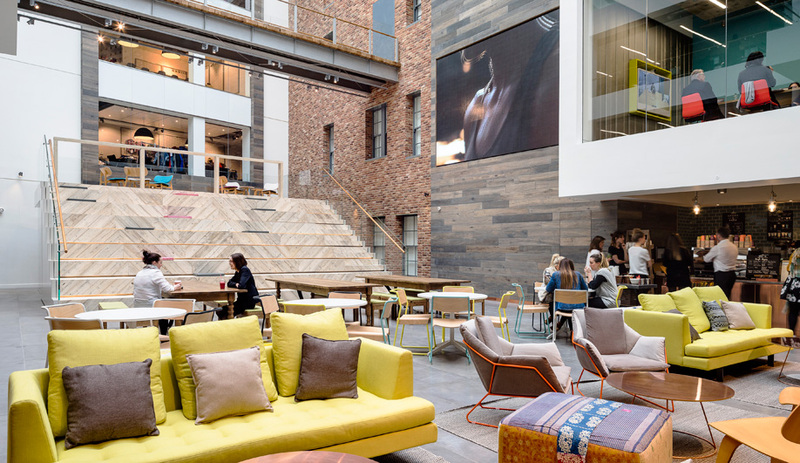 It was therefore important to create an appealing workplace in order to attract and retain talent, to increase efficiency and to boost the brand’s image.